An anterior cruciate ligament (ACL) tear is a common injury to the knee joint, with an incidence in the UK of around 30 cases per 100,000 each year. The ACL is an important stabiliser of the knee joint, being the primary restraint to limit anterior translation of the tibia (relative to the femur) and also contributing to knee rotational stability (particularly internal). Consequently, a tear of this important ligament often results in significant functional impairment of the joint. An ACL tear typically occurs in an athlete with a history of twisting the knee whilst weight-bearing. The majority of ACL injuries occur without contact and result from landing from a jump, with the athlete not be able to continue playing thereafter. An ACL tear will typically present with a rapid joint swelling* and significant pain. If the presentation is delayed, instability may also be evident, in which the patient describes the leg ‘giving way’. 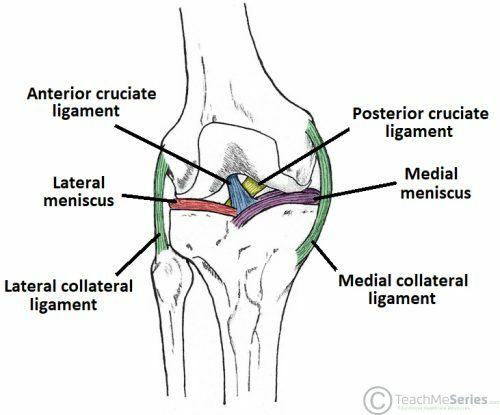 The specific clinical tests that can identify potential ACL damage are the Lachman Test and Anterior Draw Test (see below). Lachman’s test involves placing the knee in 30 degrees of flexion and, with one hand stabilising the femur, pulling the tibia forward to assess the amount of anterior movement of the tibia compared to the femur. The other knee is then examined for comparison. The anterior draw test involves flexing the knee to 90 degrees, placing the thumbs on the joint line and their index fingers on the hamstring tendons posteriorly. Force is then applied anteriorly to demonstrate any tibial excursion, which is then compared to the opposite site. Lachman’s test is the more sensitive of the two tests for an ACL tear. A plain film radiograph of the knee (AP and lateral) should be taken to exclude bony injuries, any joint effusion, or a lipohaemarthrosis present. As with any acutely swollen knee, the immediate management of a suspected ACL tear is RICE (Rest, Ice, Compression and Elevation). The specific treatment of an ACL rupture can be either conservative or surgical, dependent on the suitability of the patient for surgery and their current levels of activity. Conservative treatment involves rehabilitation, which utilises strength training of the quadriceps to stabilise the knee. In the emergency setting, inpatient admission is rarely required; the patient can often fully weight bear and a canvas knee splint can be applied for comfort. Surgical repair of the ACL (Fig. 4) involves the use of a tendon or an artificial graft. This will always follow a period of ‘prehabilitation’, whereby the patient will engage with a physiotherapist for a period of months prior to the surgery. Post-traumatic osteoarthritis is a well-established complication of both ACL injury and ACL reconstructive surgery. A Posterior Cruciate Ligament (PCL) tear is a less common injury to the knee join. The PCL is the primary restraint to posterior tibial translation and works to prevent hyperflexion of the knee. PCL tears typically occur in high-energy trauma, such as a direct blow to the proximal tibia during a RTA, or less commonly in low-energy trauma when there is hyperflexion of the knee with a plantar-flexed foot. A torn PCL will result in immediate posterior knee pain. There will be an instability of the joint and a positive posterior draw test (with a posterior sag) on examination. 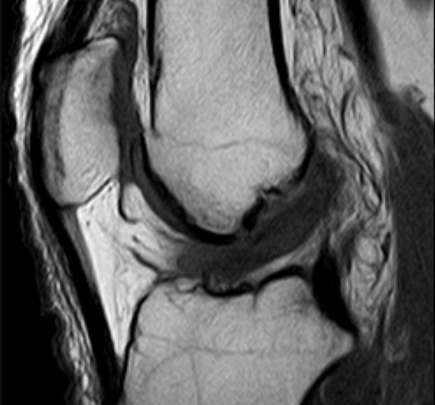 As with ACL tears, the gold-standard for diagnosis for PCL tears is via MRI scanning. PCL tears can often be treated conservatively in the first instance with a knee brace and physiotherapy. If the patient continues to be symptomatic and has recurrent instability of their knee joint then they may require surgery with insertion of a graft. If it is associated with other injuries, such as meniscal tears, then these may need to be treated surgically more urgently. Which investigation is the gold standard for anterior cruciate ligament tear? Which of the following tests is specific to ACL injury? 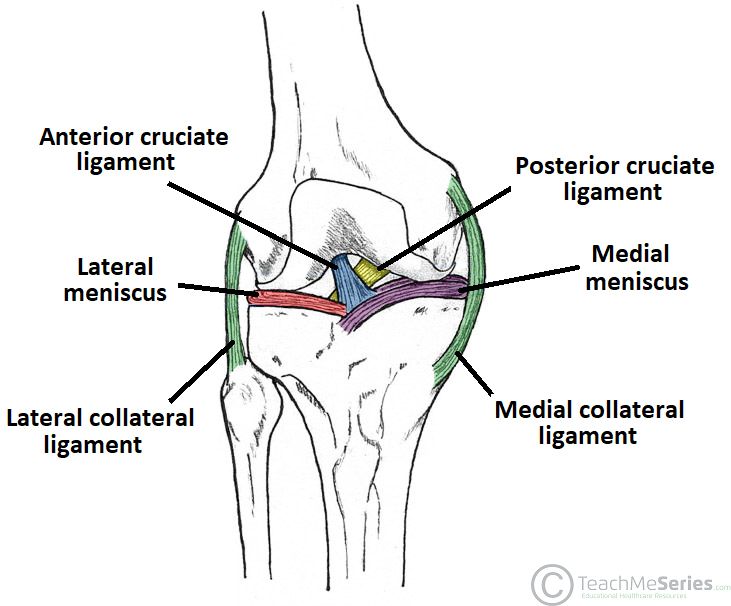 What is the main role of the anterior cruciate liagment?